The traditional poké originated from Hawaiian fishermen gathering the scraps of their fresh daily catch and curing them with a concoction of seasoning which includes soya sauce, sesame oil, lime juice etc. It was initially made with largely yellow-fin tunaand subsequently opened to a wider selection of seafood options include other types of fish, shellfish and crustaceans. The “evolved” poké bowls we see nowadays have already “walked out of the waters” to incorporate other ingredients such as tenderloin steak etc. Unconventional yes but the version we have tried before tasted really good surprisingly! 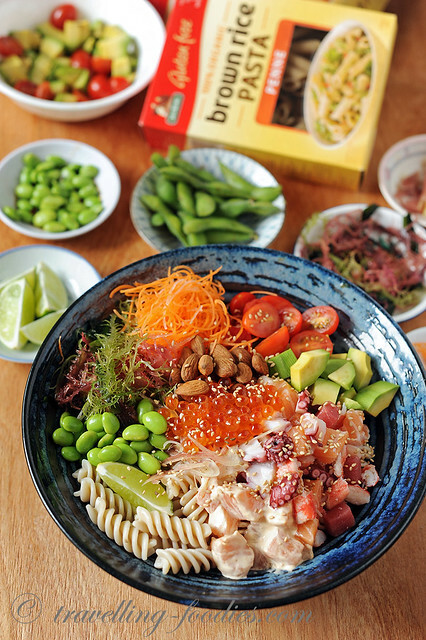 For those who love bara chirashi don, the concept of the poké should sound rather inviting. While the former boasts of the use of uber fresh seafood, curing is an integral part of processing the seafood in making poké which aims at not only preserving the natural flavours of the fish but also in accentuating them. Many poké delis here provide wakame as one of the available toppings, thin slivers in iridescent green which looked almost radioactive like. If you look closely, the sesame seeds are stained green too, a tell-tale sign that food colouring was heavily used, a standard industry practice it seems albeit unnecessary. While I loathe the additives, I love the chewy textures of seaweed, not to mention the iodine and other trace elements it provides. So I used a mixture of fresh seaweed, mainly green and red tosaka, as well as wakame of course but without the colouring. They look so pretty on their own already so no food colouring needed definitely. 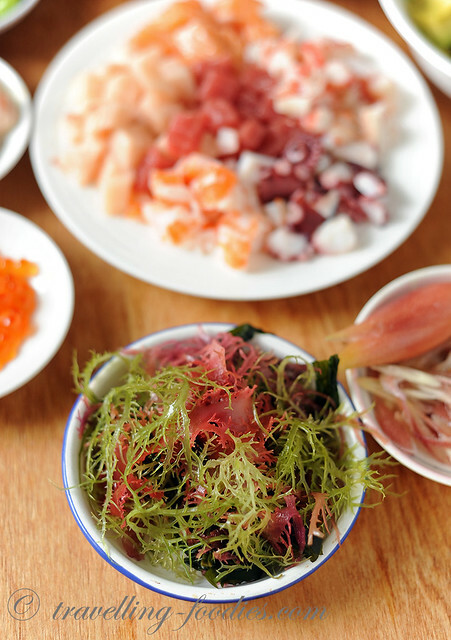 Apart from seafood, many local poké delis here complete the meal with the incorporation of a wide range of other ingredients. 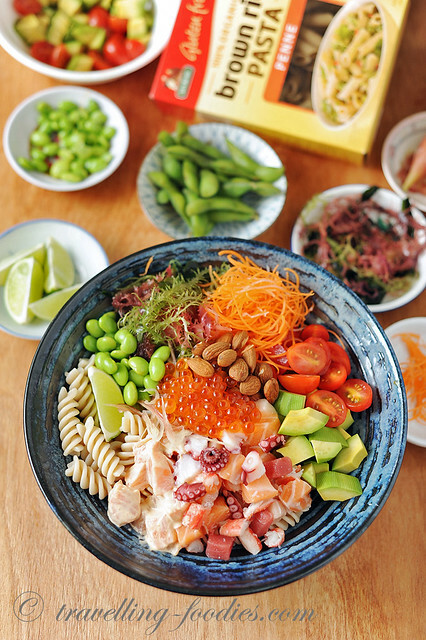 Most would have a carb base, and since many here like me relate a poké bowl to chirashi don, sushi meshi aka Japanese sushi rice seasoned with vinegar, salt and a bit of sugar is often used. Healthier options include brown rice or mixed multi-grains or even a carb-less mesclun salad. For today’s rendition, I’d used San Remo’s brown rice spiral pasta. The toppings also vary dramatically. I bought those which I personally love and that for me is the beauty of a poké bowl, i.e. you get to add what you’d like to eat. I have creamy avocado, cherry tomatoes which macerated in some aged balsamic vinegar, edamame beans, finely julienned carrots, toasted whole almonds and myoga ginger. I love the myoga as it imparts a very slightly hint of spiciness to the dish, somewhat similar to our local torch ginger bud but in a much more subtle manner. And it has that lovely mauve shade which alongside the other ingredients creates an explosion of colours on the plate, or in this case bowl which further whets one’s appetite. I’d seen other less conventional but no less yummy toppings before too like couscous, grilled pumpkin, tenderloin steak as well. In short, it is really laissez–faire where one can freely choose to add what loves to eat. In a mixing bowl, add light soya sauce, sesame oil, sugar, lime juice, pepper, salt and sriracha sauce (if using) and mix well to dissolve the sugar and homogenise the sauce. Add 2/3 of sashimi grade fresh seafood and give everything a good toss. Cling film and refrigerate for 15 min. 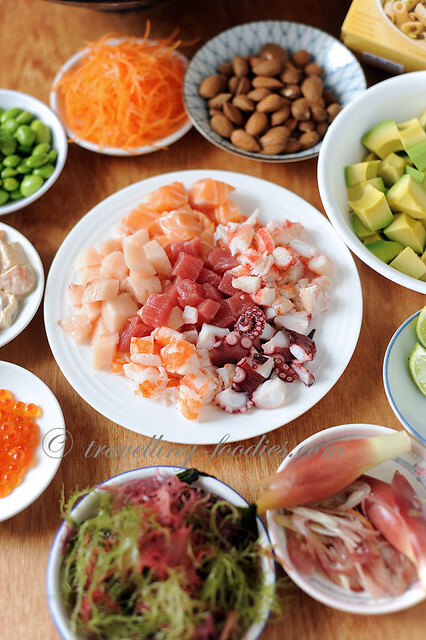 Repeat the process with remaining 1/3 sashimi grade fresh seafood and mentaiko mayonnaise in another small bowl. Into a pot of boiling water, add one box of San Remo Brown Rice Spiral or Penne Pasta with a pinch of salt and cook for 9-10 min until al dente. Drain and portion into 2-3 serving bowls. Add 1/2 tsp of sesame oil into each bowl of cooked pasta and toss to prevent the pasta from sticking together. Dress the slightly cooled pasta with the other toppings ingredients, i.e. 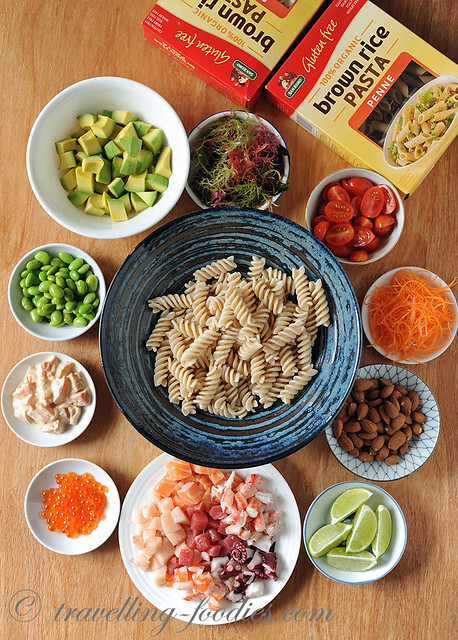 julienned carrots, edamame beans, julienned myoga ginger, diced avocado, halved cherry tomatoes, toasted almonds, shoyuzuke ikura and of course the portions of sashimi grade seafood. Sprinkle generously with toasted sesame seeds and garnish with a quarter of green lime. 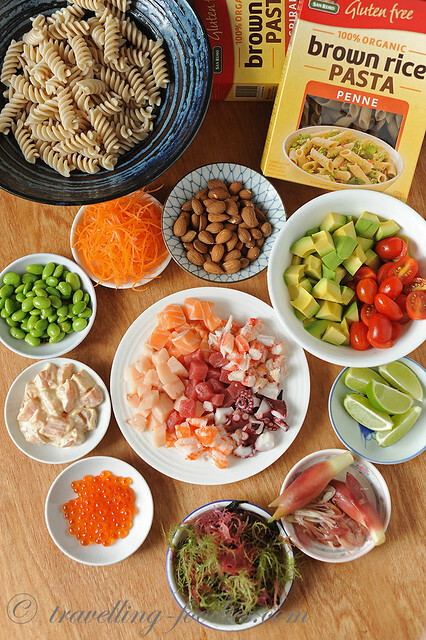 NOTE – be sure to use sashimi grade seafood from proper Japanese ingredient supply shops or supermarkets. Use the seafood as soon as possible and consume everything within 1 hour or preparation to ensure maximum freshness and avoid contamination or bacterial growth. This entry was posted on April 17, 2018 by Alan (travellingfoodies). 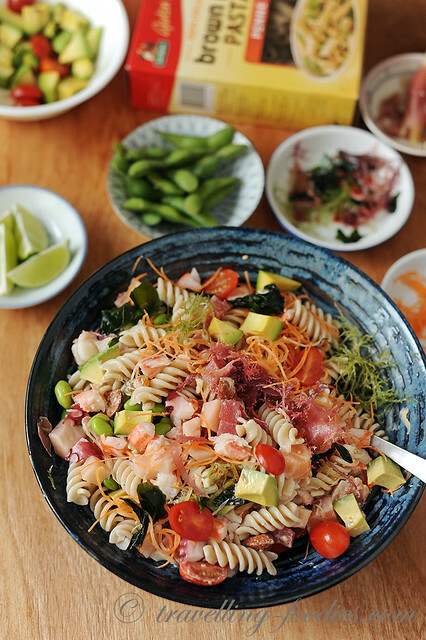 It was filed under Food, Simple Eats and was tagged with almond, avocado, cherry tomatoes, chirashidon, kaisendon, ohana, pasta, poke bowl, san remo, seaweed, spirals, wakame.